Do you need definitive Distributed Fibre Optic Sensing market data? Succinct Distributed Fibre Optic Sensing market analysis? 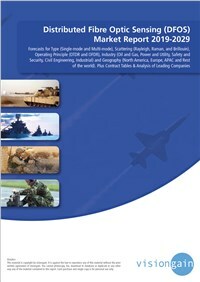 The continuously growing need for safety and security in industries including oil and gas, infrastructure security and civil engineering, has led to publish this timely report on the DFOS opportunities and applications in these sectors. The DFOS market is expected to be valued $1.4 billion in 2019. The factors influencing the growth of the DFOS market include increasing applications in the oil and gas vertical, the reliability of distributed fibre optic sensors while working in challenging environments and increasing demand from the civil engineering vertical. However, factors such as high cost of distributed fibre optic sensor systems and lack of standardized assembly are likely to challenge the growth of DFOS market during the forecast period. If you want to be part of this growing industry, then read on to discover how you can maximise your investment potential. What does the future hold for the Distributed Fibre Optic Sensing (DFOS) industry? Which industry should you focus upon?